It is the 2nd year of Seongnam International Book Arts Fair this year and it is very meaningful event since it is in commemoration of World Book Day and the 2nd anniversary of Book Theme Park and since it reflects the growing interests of people’s Book Arts in Korea. 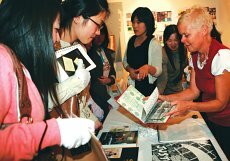 In Korea, since 2004, Book Arts market has been developed through the Book Arts Fair. In addition to this, well-known book artists from abroad were invited and their artworks were compared with ours and the international seminars have been held though the Fair. The Fair has done its role for contribution for development through these kind of international exchanges. It is estimated that the book arts population counts 40,000 domestically, more than 20 of internet community, more than 100 classes in nationwide university social education centers, culture centers, Library and Schools. 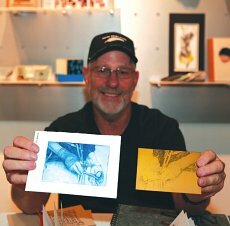 Also Book Arts associations were founded and created bonds among book artists and supported them. At this Fair, various book artists from all over the world participated, and among them, Johanna Drucker is the one who voiced book arts theories through her book ‘The Century of Artists’ Book’. This theoretical book made an academic achievement by covering the history of books from pre-medieval periods, type printing, books from Livre D’Artiste in 1800 to William Morris and various types of books in art trends after 1900, not just only book arts as a part of branches of 1960s’ new arts. Hanne Matthisen is a Danish book artist and working actively in Europe. She won the Grand Prix at The 4th Lithuanian Book Arts Fair. Besides, Tara O’Brien from USA, Home Print from New Zealand, Anne-Maree Hunter from Australia, Toshihiro Hattori and Yuko Ebina from Japan were there. Julia Barret, the president of Barret Gallery though not a participant in the exhibition, observed this fair with her curator and attended the programs to research Korean Book Arts and traditional cultures. Domestic booths presented various works, and remarkably, not only from Seoul but from other local areas. As for domestic booths, book artist groups from Seoul, Chungcheonng, Kyungnam, Pusan area such as Korean Book Arts Assosiation, The Korean Comtemporary Printmakers Association, Bookmine, E-su Craft, were participated. 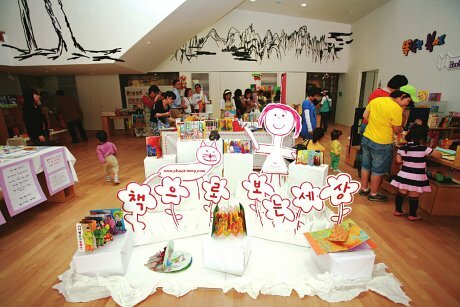 Also as for Children Book art booths, many groups participated in the fair such as The Little Library in the Forests, Story Book Arts in NamSeoul University, Picture Tree. These groups are working very hard for development of domestic book arts which has a short history. 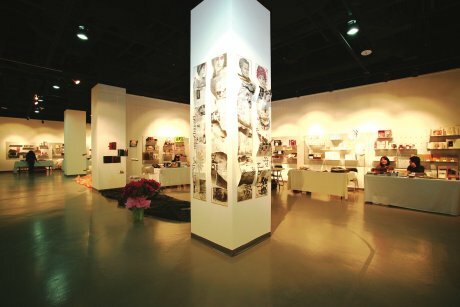 Seongnam is quite away from Seoul, yet it presented a space for the new experience of the varied world of bookarts through many events for the visitors. Especially, we tried to deliver information as much as possible in a short time, by renting an auditorium (with 400 seats) in Seongnam Art Center for 4 international book artist conferences with simultaneous interpretation service. In addition to this, we afforded residences of Sujeong-gu and Jeungwon-gu to meet artists by visiting them through ‘Visiting Book Arts Workshop’ dealing with Homeprint from New Zealand. Also, Meaningfully, Mrs. Eva Vargo, Wife of Ambassador of Sweden, presented her artworks using traditional Korean papers and held a party with her husband for participants from abroad and staff on the eve of the Fair. In the future, we hope that Korea can present a larger and more developed book arts fair as a book arts leader in Asia and that book arts can be considered as a kind of major genre of fine arts.